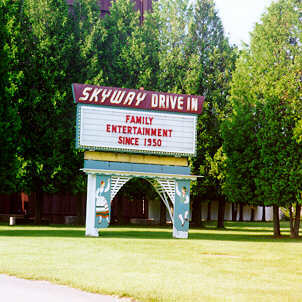 SKYWAY DRIVE-IN THEATRE. Hwy 42 between Fish Creek and Ephraim. One of the last drive-in movie theatres in the state. Current movies in a nostalgic setting. Door Countys family entertainment bargain since 1950. Come relive fond memories and create new ones at our family owned theatre. Double feature nightly. Radio Sound. Playground. Snack bar featuring fresh hot popcorn, footlong hot dogs, pizza. Call 854-9938 24 hours a day for movie information. Fri June 2-Thu June 8 gate opens at 8pm, show starts about 8:50pm. Wonder Woman (PG-13) followed by Going in Style (PG-13). Second show starts about 11:20pm.